The return of the BlackBerry. After two years of development behind the scenes, the Canadian firm BlackBerry comes back on the market with their brand new BlackBerry 10 OS and their new Z10 model. Outfitted with a high-resolution 4.2-inch display, a powerful Qualcomm S4 SoC and useful extras, the smartphone finally steps onto the stage. Is that enough for it to hold its own amidst the long-established competition? An excellent effort from BlackBerry, the BB10 OS is smooth and has all the key features you'd expect. It's easy to navigate and the messaging hub is the best on any platform. The hardware included in the Z10 is also up there with iPhone and Galaxy S3. Galaxy S4 vs BlackBerry Z10 comparison review - which is best, the Samsung or the BlackBerry? The Galaxy S4 looks similar to the Galaxy S3 in design: it's pretty different to the BlackBerry Z10, which from the front at least looks like a squarer iPhone 5. The Galaxy S4 is rounded and pebble-like, the BlackBerry Z10 a thin-and-stylish rectangular slab of black. The Galaxy S4 is mostly plastic with a removable cover, while the Z10's front is almost all black, but it also has a thin plastic removable cover. 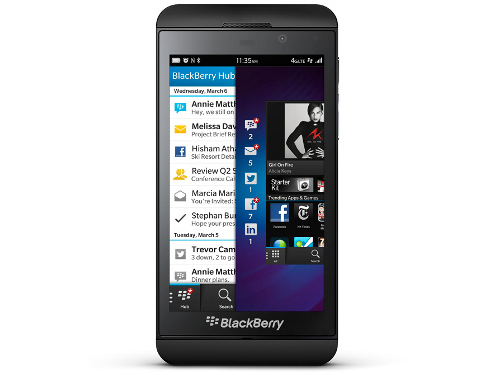 The BlackBerry Z10 is sleek and sophisticated device with superb build quality. It has a lot of things going for it such as a sharp 4.2" screen, fluid gesture based UI, impressive multimedia performance, and a great keyboard. However, it's the price tag of Rs 43,000 that holds me back from whole-heartedly recommending it. Looking at the features it offers, I think the right price for this handset should have been around 35k. Having said that, if you're BlackBerry fan who can live without maps, then go for the Z10 — it's the best touchscreen device that the Canadian manufacturer has ever produced. Otherwise, the iPhone 5, Lumia 920, and HTC One are better buys. Like the PlayBook, and also Windows 8, the Z10 makes extensive use of edge-swipes to access key features. With the phone in standby, you can swipe up to unlock the phone. From the lockscreen, a swipe down from the top edge puts the phone into bedside mode. A single swipe from the bottom of the screen in any app takes you back to a multitasking view, where you can switch apps, dismiss them with a tap, or swipe right to left to access the app-launcher view. Finally, and most usefully, if you swipe up from the bottom of the screen in any app and hold down your finger, you can take a quick peek at your messages, then swipe right to access the BlackBerry Hub. Qualcomm Adreno 225: Integrated OpenGL ES 2.0 and Direct3D 9_3 capable graphics card. These graphics cards are not suited for Windows 3D games. Office and Internet surfing however is possible. » Further information can be found in our Comparison of Mobile Graphics Cards and the corresponding Benchmark List. S4 Plus MSM8960: High end dual core Soc (Krait cores) including a Adreno 225 GPU.» Further information can be found in our Comparison of Mobile Processsors.